Note: If you can provide a review, or concise info for a particular artist, please submit to: rpressl@bizmarts.com for inclusion herein. Our Online Store is Located Here. Andreoli Usually referred to as the “Andreoli Hallmark Clowns”, there were about 15 sculptures in the set. The clowns date from the 1978 and 1979 Hallmark catalog. Material is poly-resin. Artefice Ottanta There are about five of these chalk figurines, most signed by D. Esposito. Jean Boggio for Franz Porcelains A multi-talented creative spirit, Jean Boggio is best known in France for his magical jewelery creations. His extravagant “palace” rings, a daring concept that first appeared in 1988, have been a major influence, as have been his circus characters, grouped together as a bracelet or in the form of a necklace. Originally trained as a gold and silversmith, this native of Lyon has also been at work behind the scenes for prestigious tableware companies such as Baccarat and Haviland, and also for the luxury goods company, Les Héritiers. From his workshop in the Beaujolais region, he now specializes in jewelery, a passion of his since 1984. He also works on the development of the new Jean Boggio for Franz porcelain brand. Capodimonte Capodimonte porcelain is porcelain created by the Capodimonte porcelain manufactory, which was established in Naples, Italy in 1743. Capodimonte porcelain was made in direct emulation of Meissen porcelain. Capodimonte is famous for its molded figurines and its decorative modeled flowers applied to cups and vases. Founded in 1990, Cast Art Industries is a leader in the collectibles and giftware industries. The Company’s leading product line, Dreamsicles, is sold throughout the United States and has a large and loyal collector following and recently enrolled the 100,000th member of its Dreamsicles Club. The Company has extensive retail distribution in more than 15,000 specialty giftware and collectibles customers throughout the U.S. Cast Art markets its products in a larger portfolio of figurine brands including Dreamsicles, Slapstix, and Ivy and Innocence.The Company is proceeding to expand into the decorative accessories business with the introduction of a new division known as Et-cetera, which will introduce more than 250 new home decor products at the January gift shows. Cast Art, whose headquarters are in Corona, CA, employs approximately 150 people. The Company also has a long-standing product development and sourcing presence in China. Clowning in America – Chuck Oberstein Chuck Oberstein was born December 18, 1935 in Los Angeles, California. He graduated from Montebello High School.He was a jeweler in the family business and once worked at a diamond retail store, when he was encouraged to be an artist by a friend, and quit the same day. Oberstein is widely regarded as the definitive clown painter. He was sometimes called “The Magician” for his unique superimposing of clown faces and was known for his sparkling tear drop on his sad clowns, especially the Wall Street Journal Clown. Oberstein also painted seascapes, horses, portraits, children, and various other subjects, at first doing landscapes and still life. Chuck began in Europe and painted over 40 years. He worked in both oil and acrylic, and used live models including many family members as themselves and as clowns. His original art can be seen in prints, lithographs, posters, cards, figurines, and collector plates around the world. He worked at the Disneyland art gallery, and also at Warner Brothers, quitting there after one day. His favorite artist was Rembrandt. At one point he joined the Army, creating murals for the buildings where he was stationed in England. Chuck put the number 442 in his paintings, sometimes interestingly hidden and often obvious in reference to 442 Ackley St. Monterey Park, CA, the place where he first began to paint again after he returned from Europe. For many years he let collectors guess what the 442 was all about and loved not telling and just hearing their guesses. Oberstein believed clowns represent freedom, because they will do anything. He was a vegetarian and loved jazz, playing the piano, weight lifting, running, golf, skiing, body surfing, dancing, sports, tennis, dogs and horses, family and friends. His whimsical clowns represent the many things he loved in life as well as a deep spiritual knowing that comes through his lighter clowns in his later years. His portraits are of masterpiece quality similar to Rembrandt’s style although he painted fewer of these and they are not in print. D. Esposito Domenico Esposito created mostly avian and animal sculpture; but his clowns are frequently assigned to the Artefic Ottanta collections. Dave Grossman Known especially for the GWTW and Norman Rockwell figurines.Catalog available of all know works here. De Capoli The De Capoli collection appears to come from “The Gold Union Corporation:, a Hong Kong based company. The registration information for the figurines is here. Giuseppe Armani Giuseppe Armani was born in Calci, Italy, in 1935. From the moment young ‘Bebe’ could pick up a pencil, he drew. He drew everything he saw. He drew everyone he knew. He drew all day long. Armani’s parents were amazed at Giuseppe’s prodigious output and they recognized that their little boy’s sketches were more than just the whimsical drawings of most children. Uncanny realism and attention to detail revealed Giuseppe’s true talent. He had The Gift.Giuseppe’s teachers decided that Armani should attend the Academy of Fine Arts in Florence. Unfortunately, as the arrangements were being made, his father died unexpectedly. The family needed Giuseppe now. Art school was forgotten. But the Art was not. Giuseppe Armani’s natural talent was finally recognized when a local priest organized an exhibition of young artists; Giuseppe entered a sculpture of a classically inspired male torso. The work was greatly admired for its extraordinary anatomical precision. When the torso was taken to the Art Gallery in Pisa — located across the street from the famous Leaning Tower — Giuseppe Armani’s talent was rewarded with the offer of a permanent job there. In Pisa, Armani’s dream of studying art was finally realized. He immersed himself in the great masterpieces of the Renaissance that he had only read about in books. He traveled to Siena and Florence and began to hone his personal style; Giuseppe drew heavily on the style of 16th Century Florentine Renaissance. Sculpture, Armani realized, allowed him to work in three dimensions. He infused life, character and even soul into his works. Giuseppe experimented in wood, clay, alabaster and marble and his reputation grew with each breathtaking creation. Art admirers soon started flocking to the gallery to see Armani’s latest efforts. In 1975, the Florence Sculture d’Arte, recognizing Armani’s genius, offered him the opportunity to work exclusively for them. He would be encouraged to give free rein to his artistic muse. Giuseppe Armani accepted. For more than 20 years Armani has created masterpieces ranging from traditional Capodimonte style to more daring, contemporary, sometimes whimsical sculptures. Always, Giuseppe infused his figurines with breathtaking realism — with a spark of life. This continues to amaze even his many admirers the world over. Giuseppe Armani describes his credo this way: “Although I consider myself a direct descendant of the Renaissance heritage, I believe that an artist has to follow his own evolution and not solely be a ruminant of the past, as glorious as it may have been. An artist conducts a search that may lead him far out in exploring new areas of interest. I continually search to discover new and better means of expression. Hecho a Mano Guzman These are Vintage Clowns by : CERAMIC GUZMAN CLOWN HECHO A MANO EN COLOMBIA which means Hand Made in Colombia. They are currently valued on the retail market ( cost replacement ) for an average of 350.00-400.00. J.J. Jones Most piece are resin on wood base. Sculptures typically comes with labels showing: Chadwick-Miller Inc, Canton, MA. a wholesale distributorship of Christmas and Easter merchandise, figurines and candles, garden and patio items, home decorating items, housewares, stationery, and toys. Most items are made in China. John McCleland John McClelland, came out with “Porcelains in Miniature”. 10,000 of each figurine was made aka LE=limited edition. There were at least 20 children figures as I recall-originally came in cardboard sleeve over Styrofoam insert-marking on box said Port Washington, NY. New ones had original gold foil tag plus COA. Judis Pastime Listing of all Judis Pastime creations with registration info available here. Lladro In 1953 Juan, José and Vicente Lladró make their first creations inspired by an experimental vocation in a Moorish furnace built in their own home in Almàssera (Valencia). In this way, they develop their artistic interest as they worked in a tile and crockery factory. These carefully designed pieces already have a special charm that awakens public interest. By 1955 they begin making sculptures in which a clear influence of the trends of the XVIII century can be observed. These pieces evoke the works of former porcelain artists such as Meissen, Sèvres and Capodimonte. In 1958 Juan, José and Vicente decide to dedicate themselves exclusively to their own works and transfer their small company to a warehouse in the neighboring town of Tavernes Blanques, because the family workshop has become too small for their business. Demand for Lladró creations grows unexpectedly.The brothers introduce innovations not only in the design and style of the figurines but also in the firing techniques, reducing the three-layer firing to a one-layer process. One-firing is an innovative method which creates the crystalline finish and the pastel tonalities typical of Lladró works. They soon decide to incorporate a logo on all their figurines. Beside “Porcelanas Lladró”, they add a Greek master piece, the Victory of Samotracia, thus associating their surname to the ideal of classical art. Paul Sebastian – Meico Paul Sebastian is best know for the Collection ‘Dreams’ Clown Porcelain Fine Figurines in muted pastel colors with red felt base. They have detailed face and hands characteristics. This Clown, known as the “Sad Clown” measures 7″ tall and has no chips, cracks or other marks. The age is unknown on this piece. Doing some research I found it was made by Meico Inc. GA/Republic of China.A comprehensive catalog of all Sebastian World sculpture. Precious Moments It all began more than thirty years ago, when Precious Moments® creator Sam Butcher began drawing the endearing teardrop-eye children he called “Precious Moments” as gifts for family and friends. Today, his Precious Moments artwork is among the most recognized art in the world, sharing messages of loving, caring and sharing with collectors from around the globe. His dedication earned him a scholarship to the College of Arts & Crafts in Berkeley.In the early 1970s, Sam and a friend, Bill Biel, started a small company to produce his Precious Moments art on a line of cards and posters, calling their company Jonathan & David. They took their goods to the annual Christian Booksellers Association Convention in Anaheim and their tiny booth was filled with enthusiastic retailers wanting to order the new line. The crowd became so large that neighboring vendors came over to help the two young men write orders. Shortly thereafter, Sam was approached by Enesco Corporation to develop a three-dimensional figurine based on his artwork titled “Love One Another.” By the end of 1978, the first twenty-one original Precious Moments figurines were introduced to the market. People began to write to Sam, telling him about how the Precious Moments figurines had touched their lives in a moving and heartfelt way. The collection is now well over 1,500 pieces with new introductions offered each year. Members of collector’s clubs continue to be found throughout the world. Even more telling, since its opening in 1989, Precious Moments Park in Carthage, Missouri has welcomed approximately 400,000 visitors every year. Pucci Arnart There seems to be a distinction between the “vintage” Pucci Arnart clown figurines dating to the 1980’s, and the current editions sold under the Arnart Imports mark. The latter are mass produced Chinese imports without real distinction; but the former are very well done and command reasonable selling prices for giftware/art work. Ron Lee About Ron Lee, American ArtistAs an Artist, Sculptor, and Manufacturer, for over 45 years, Ron Lee has created the world’s largest and finest collection of Limited Edition Figurines. Ron was born in Southern California, July of 1947. He began his career at the ripe old age of 12 by carving and building elaborate ship models. As a teen, he worked with his father and learned the “lost wax” process. He sculpted and cast wildlife and western artwork in bronze. 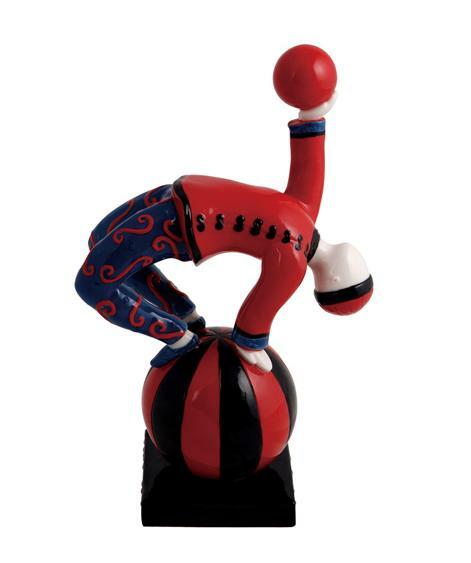 His fun-loving nature and his great love and passion for the circus, is what lead to the creation of clown figurines, which he is known for, throughout the world. Ron has created over 2,000 different designs, which also include animation characters. Over 5,000,000 of Ron’s creations are in the homes of the most discerning collectors! His wonderful selection of limited edition figurines are manufactured in his Burbank, California Studio. Ron takes great pride in his craft, and has maintained a passion unlike any other artist. It is Ron’s most sincere wish that his collectors enjoy the art he has created, as much as he has enjoyed creating it. All Ron Lee Art is proudly Made in America. San Francisco Music Box The San Francisco Music Box Companywas founded in 1978 and became one of the largest retailers of musical gifts in the world. The first store was opened on San Francisco’s bustling Pier 39 boardwalk and became the flagship store for a chain that featured over 300 stores in almost every mall in the U.S and Canada. Throughout those years, the brand reflected the highest in standards for detail, quality and execution and the products created a loyal following of millions of consumers world-wide. All of our products are exclusive to SFMB and include award-winning designs in water globes, figurines, carousels and Italian inlay wood music boxes. Every item from San Francisco Music Box Company is musical and features either an 18-note movement or a long-playing chip and the musical experience sets our music boxes apart from other gifts.